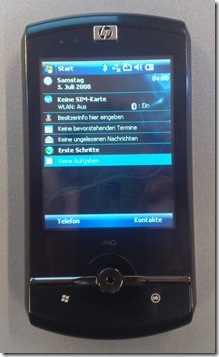 The Data Messenger from HP is their newest flag-ship in Pocket PC Technology. At the moment you can only buy it from their website for none less than 599€ or 440 British Pounds (including VAT) and I myself am pretty sure that this amount of money is not worth it yet to own this device. As with most other devices the price will most certainly be lower with retailers and of course with carrier plans as soon as they’re introduced. 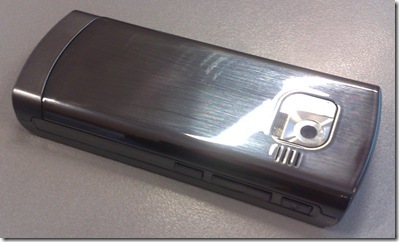 Although it has a very nice optical appearance, just like its little brother, it is just another Windows Mobile device with its own little extras. 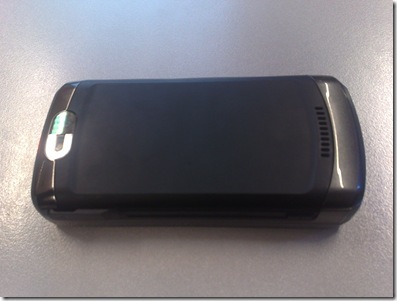 Nothing really blew me away about the device. In Part 1 of my review I promised to go into detail about the buttons and connectors on the side. On the left hand side you have (from top to bottom) a Lock-Button (which is just as complicated to operate with this device), 2 Volume Buttons and a Voice Dial/Command Button. On the right hand side you have (from top to bottom) the micro-USB connector, the 2.5mm audio out (read previous post for details) and the Snapshot-Button for taking photographs which worked better with this device. On Top of course you again have the Mute-Switch which was the first positive factor I recognized about both devices. And that’s about it. Furthermore the Screen has a very static and stale feel to it, especially when you operate it with the stylus. I’m used to having a Touch-Screen sink in when operating it with a stylus. It assures me that I just made a click. The full QWERT-Keyboard seems quite OK concerning the layout. I didn’t work too much with it since I assumed it would work just like you’d expect it to. So I assume that the previous iPAQ device of this category didn’t lack any major feature of this one and I would just consider it a minor update to it. As soon as I see it for a reasonable price I might know some people I could suggest it to but not yet. So I want to kick off my review with a short introduction to the devices and what they have in common. No personal opinion in this post. 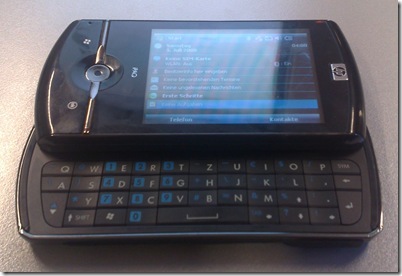 The Voice Messenger (on the left in my last post) is a Smartphone in the shape of an ordinary mobile phone, so it is compact, yet with Windows Mobile it has a quite sophisticated Operating System on top of it for a rather small device. 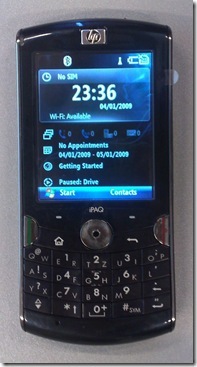 The Data Messenger is a full-featured Pocket PC with a QUERT-Keyboard for landscape-operation and a touch-screen which can either be used with your finger or the included Stylus. Both have the exact same Status-LED to the upper left of their screens. The navigation is handled by a circular Hard-Button with a tiny Trackball in the middle. The Buttons and connectors on the sides are the same. Read my next posts for details. On top they have a Mute-Switch. They both have a 3.1 Megapixel autofocus camera with LED-flash. Furthermore you can of course see that they both have the same optical appearance concerning their enclosure and design. Stay tuned some more for detailed Reviews of each device and a personal opinion. Hope I didn’t miss any similarities. 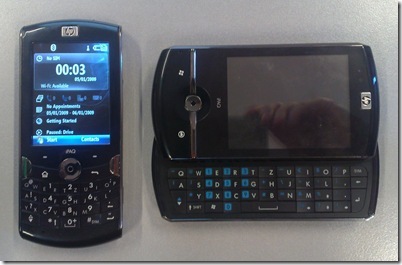 Just a little taste of the 2 new (and I think yet unreleased) HP iPAQ Devices I’m going to review for you either today or tomorrow.